IKEA North America Services of Conshohocken, Pa., is recalling about 30,600 Gothem floor and table lamps. Cables damaged during manufacturing can come in contact with the metal body of the lamp, posing a shock hazard to consumers. Three reports of minor shock have been received worldwide. The lamps are brush-finished nickel plated and have a dimmer switch. 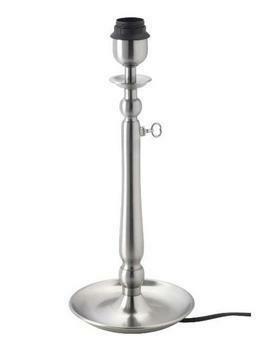 The floor lamp is 49 inches tall, and the table lamps are 14 or 18 inches tall. “Gothem” and the IKEA logo are printed on the label attached to the underside of each lamp base. The lamps, manufactured in China, were sold exclusively at IKEA stores nationwide and online at www.ikea-usa.com from October 2015 through February 2016 for between $20 and $50. Consumers should immediately stop using the recalled floor and table lamps and return them to any IKEA store for a full refund. Consumers may contact IKEA toll-free at 888-966-4532 anytime or online at http://www.ikea.com/us/en/about_ikea/newsitem/031716_recall-GOTHEM-lamps for more information.